Google Business helps organizations unlock marketing power that they may not otherwise have access to. This includes applications like Google Ads, which assists companies in determining ideal keywords that offer higher Search Engine Optimization (SEO). When these tools are used together with Google Display Ad, a company can further expand their reach. Google Display Ads is a service that the tech giant offers that includes blog pages, news sites and other web pages that are capable of having ads displayed on them. This means you will be able to reach users as they surf the web, check emails or watch videos. Google’s Display Ad Building tool is a great tool that allows companies to easily and simply design their ads. However, it is important to design an ad with the right dimensions, or your company will miss the opportunity to reach hundreds of thousands of internet users. Why Choose the Correct Dimensions with google display ad? When it comes to online advertising, each dimension has a different use and is designed to appear differently depending on the device that a user is viewing the ad on. This means that an ad built using dimensions for a standard web page will not appear as easily on a mobile device. If you choose to use a format or dimensions that have not been specified by Google, your display ad may be ineffective in reaching users and particularly your target audience. To get the most out of Google Display Ads, you need to understand the different dimensions and when to use them. Knowing this, you will be better equipped to create ads that convert. Often times, companies will select the biggest ad they can — but this is not the best approach. The objective of display ads is not to get a vast amount of internet users to see it, but rather to get them to click through to your website. As more and more consumers use their mobile phones to browse, watch and shop, having display ads that will appear on smaller devices is essential to any online marketing plan. It is important to get a marketer’s guidance when it comes to the various ad dimensions that you have to pick from. There are so many minor differences between the ads, but the dimension you select will determine where on the page your ad will appear. For example, there are two different leaderboard sizes; one is 728 x 90 while the other is 970 x 90. Although you may be inclined to pick the larger size, it may not be the right choice to attract your target audience. According to Google, there are at least five ad sizes that you should consider for your marketing campaign. These are the 336×280 large rectangle, the 300×250 medium rectangle, the 728×90 leaderboard, the 300×600 half page, and for smaller screens, the 320×100 large mobile banner. Choosing the best dimension and placement of your display ad is a critical part of reaching your audience. 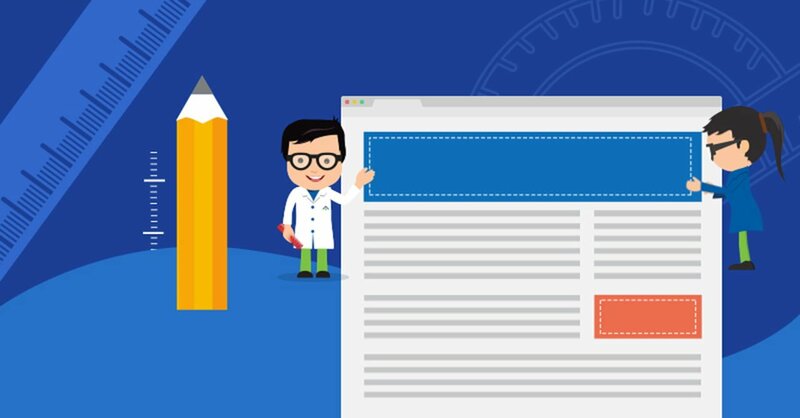 Because there are so many different sizes and options for creating your ad, we have developed your ultimate guide to Google Display Ad Sizes and Dimensions to help you. One look and you are good to go! There are many, many different sizes of Google Display Ads that can be created but each one has a very specific purpose. For organizations that want to target niche audiences it is particularly important that you select a size that will work with the web pages you plan to advertise on. Our ultimate guide gives you a rundown of all the options that are available, where on the page they will appear and a visual demonstration of what they will look like on the website. Here is a summary of the top ad sizes, according to Google. 300 x 250 medium rectangle: It performs best when it is placed within the content or at the end of an article. 336 x 280 large rectangle: Because it has more ad inventory it can lead to more revenue. Like the medium rectangle, it does well when it is placed within the text or at the end of articles. 728 x 90 leaderboard: These ads do best when they are put at the top of a page, before the main content or on forum sites. 300 x 600 half page: An ideal size for organizations that want to get their message across. This size helps brands create a more visually impactful ad. 320 x 100 large mobile banner: For marketing campaigns that involve a mobile element, this size of banner ad is the best option; it is twice as tall as the mobile leaderboard. The Google Display Ad Building tool is a fantastic resource to help you design an effective online ad quickly and easily. Yet, creating the right size of ad can be a challenge. Building a display ad with the correct dimensions can mean the difference between reaching your target audience and having them ignore your ad completely. Our Ultimate Guide to Google Display Images is the perfect resource to help your marketing team decide what ad size is best for your campaign. We have designed our infographic so that you can see how your ad will look when placed on the web page.